This 17 year old female initiated d4T/3TC/EFV in January 2008 (at the age of 14). She had a past history of pulmonary TB in 2003 for which she had completed six months of anti-TB therapy. Her baseline CD4 cell count was 77cells/ul, WHO clinical stage 4. At initiation she had severe wasting, with baseline weight 23.4kg (weight-for-age below 5th centile). On review it was discovered that her HIV status had not been properly disclosed to her by her family until 2010. She still had a relatively poor understanding of HIV and of antiretroviral therapy, although she knew the names and doses of her medication. The first year on ART was good with decent viral suppression and Immunological recovery. However after that her viral load went on an upward trend and her CD4 started going down a year later. The accumulation of multiple mutations, including multiple TAMS is suggestive of long term treatment failure. This individual has resistance to all three of the ARVs that she is currently receiving. She has high-level resistance to efavirenz (EFV), lamivudine (3TC) and stavudine. 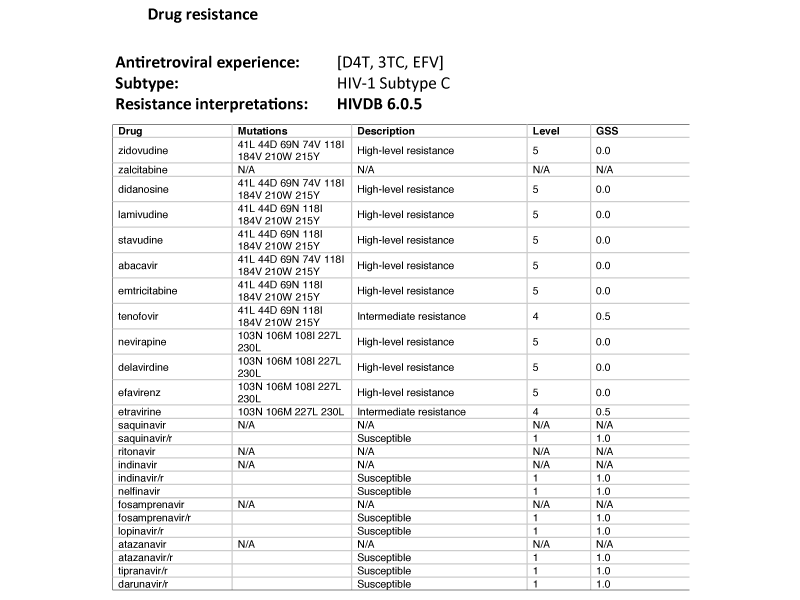 Her HIV population has multiple NNRTI-resistance mutations (K103N, V106M, F227L and M230L). She has the characteristic NRTI mutation, namely M184V, in addition to three TAMs (M41L, L210W and T215Y). The above TAM combination results in intermediate resistance to tenofovir (TDF). This patient has been failing for a very long time and has unfortunately developed a complex resistance pattern. Her chance of suppressing on a standard regimen 2 may be limited, especially in light of her high VL. It is almost impossible to treat this patient without a new class of antiretroviral drug, like an integrase inhibitor. She already has significant resistance to etravirine, so this new class of NNRTI would not be an option. The best combination seems to be an integrase inhibitor (raltegravir), CCR5 blocker (maraviroc) and LPV/r. Raltegravir is unfortunately not yet available in the public sector. Maraviroc can only be used if the patient has a R5 tropic virus, but the tropism test is expensive and neither the test nor the medication is available in the public sector. Given these limitations, one probably has to settle for a suboptimal regimen and the most reasonable suggestion seems to be a combination of TDF and 3TC with a double-boosted PI. Even though this combination is controversial, it is widely used in the rest of Africa, apparently with some success. A possibility would be a combination of LPV/r with either saquinavir or atazanavir, whichever the pharmacy can make available. There is emerging data about the safety and tolerability of combining LPV/r and ATV. The drug interactions between TDF and ATV seem not to be clinically significant and should not deter one from using such a combination, provided the ATV is boosted with ritonavir. Once the VL is suppressed the second PI can be stopped. It is vital that issues of adherence are thoroughly explored and addressed before any treatment changes are made. If there are ongoing adherence problems, a holding strategy of 3TC monotherapy can be considered until such time as this has been sorted out. I.  Why has she developed so many resistance mutations? II. Is there any evidence that adolescents have poorer outcomes on antiretroviral therapy than older adults? III. What interventions would you put in place for this patient before switching her antiretroviral therapy? I. This patient has been left on a failing regimen for a very long time, most probably in the presence of sub-optimal adherence. This allowed the virus to replicate in the presence of drug, thus facilitating the development of multiple mutations. II. Yes. Adolescents are well known to be a challenging group of patients to treat and poorer treatment outcomes have been described. III. Intensive adherence support by a counsellor and possibly an adolescent support group, education about HIV, allocation of a treatment supporter, close monitoring and follow-up, exclude alcohol and substance use. I. There is increasing evidence from Southern Africa that outcomes for adolescents on antiretroviral therapy are poorer than for older adults. Additional interventions may be required for this group.